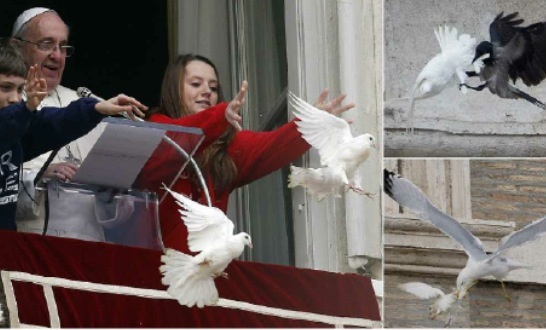 VATICAN–In a gesture at the Vatican’s annual “Caravan of Peace,” Pope Francis happily watched as two children at his side released a pair of white doves as symbols of peace and unity from the window of the Apostolic Palace. But just moments later, two metaphors, one, of the world’s unwillingness for dialogue, and the second, its utter hostility at the thought of compromise swept down on the hapless symbols of peace as tens of thousands of people in St. Peter’s Square looked on. One dove managed to break free from one of the metaphors, losing a few feathers in the brawl, symbolizing that, though the chance of peace in the world is not dead, that it is severely fragile to more dominant and negative attitudes. A crow playing the metaphor of the world’s hostility toward compromise had a better grip on the other dove, pecking the symbol of peace repeatedly, reminding all those gathered that in the face of hatred, there really is not much of a chance for peace anywhere in the world, let alone the Middle East. In the end, both symbols of peace got away, although the extent of their injuries wasn’t immediately clear. The boy looked upset at the bird’s misfortune, prompting the pope to embrace him and pat his head. The young girl appeared to be cynically laughing at the turn of events, perhaps realizing for the first time in her short life that achieving peace is doomed to violence and struggle against the oppression of tyrants and Muslim terrorists.